This 39" diameter painted equipale round table and 4 matching upholstered chairs set is available in a choice of 4 colors. 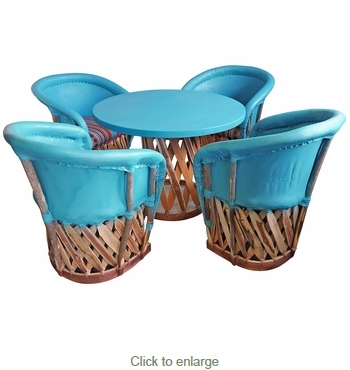 This colorful round equipale table and barrel chairs are crafted from tanned pigskin and Mexican cedar strips. Perfect for a log cabin or southwest porch, patio or yard. Equipale furniture will create a southwest or rustic atmosphere in any room of your home. Table and chairs also available individually. See below.